TIred of your Chronic Sinus Infection and Sinus Headache? Are You Suffering with Chronic Sinus Pain? Sinus Pressure, Congestion and Swelling are Making Your Life Miserable! Your persistent cough, sneezing, and sniffling have you up late at night. You wake up with puffy eyes and a stuffy nose. You can’t taste or smell, and you’re miserable with a constant nasal drip that just won’t go away. Sore throat, headache, and facial pain have been wearing you down for days or weeks without relief. These are all signs of sinusitis, or a sinus infection. When the sinus-lining tissue becomes inflamed, infection may result in one of several different types of sinusitis. Swelling impairs normal sinus function, causing the sinus cavities (the hollow spaces behind and around the eyes and nose) to become a stagnant breeding ground for bacteria and viruses. Many sinusitis sufferers can be treated with home remedies, such as OTC (over-the-counter) medications. But, if you experience lengthy periods of sinus pain, you may be stuck in a cycle of sinus infection. How Can I Break the Cycle of Chronic Sinus Infection? Most cases of acute sinus infection are typically short and persist for less than two weeks. Headaches, pressure and swelling should be expected as the infection runs its course. If your condition includes such unpleasant symptoms as fever, nasal discharge, irritated, watery eyes, or a cough that just won’t go away after 30 days, you may be experiencing chronic sinusitis. When a sinus sufferer experiences four or more episodes of chronic sinus infection in a single year, this is known as recurrent acute sinusitis. 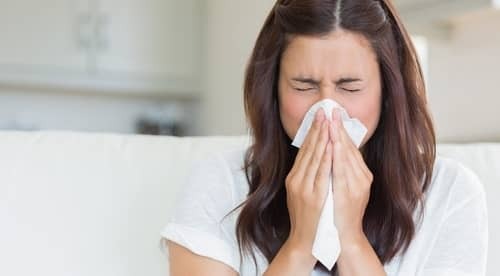 By this time in the sinus infection cycle, you may have made multiple trips to the doctor, and been prescribed medications or antibiotics that seem to have little or no effect. You want to achieve long-lasting relief, but you have become frustrated by your painful, recurrent symptoms. Dr. Hasslinger and his team of sinus care specialists will determine the root cause of your sinus pain and begin to create your personal treatment plan. The Ear, Nose, Throat & Allergy team will explain your treatment options and help you to understand possible outcomes. Tired of Searching for Sinus Relief? Contact the Ear, Nose, Throat & Allergy team to learn more about sinusitis treatment options available in Cumberland, Maryland.